Motion sensor, UV lamps, Felt, polyurethane. This installation piece took the form of a cave-like space, (approximately 5m x 3m x 2m) consisting of soft white walls overrun with stalactite like protrusions and sprouting organic growth-like forms within its far corner. As the viewer approached the entrance to the space, green bulbous forms could be seen on the far wall. On walking into the centre of the space, a heat sensitive mechanism acted on the bulbous forms which slowly changed colour from green to white, and dissolved into the surrounding hue of the white walls of the cave. On leaving the space, the heat activation ceased and the forms slowly turn to green, as if growing back. I’m growing to love you entailed my first experimentation with time based heat sensitive medium. 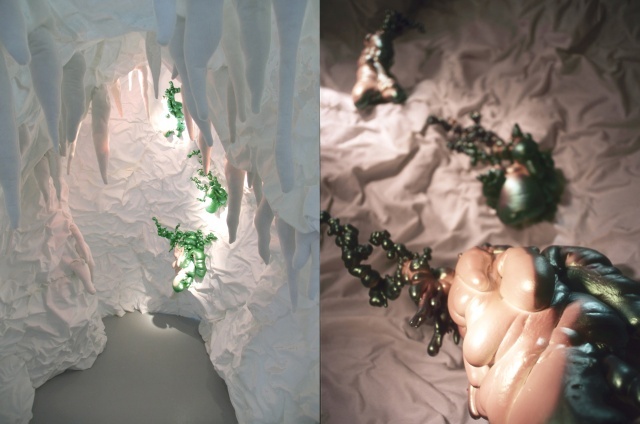 The cave created a time based, heat reactive space, which utilized motion sensor technology to respond to the viewer’s presence by activating hidden heat lamps which slowly heated the painted surface of the bulbous growth forms, dissolving the green heat sensitive paint as it did so, and revealing the layer of white paint beneath. The cave space also acted as a life-size version of the work Deep deep down. The aim was to create a walk-in altar or grotto in which one could engage with other kinds of “life”, in this case, the organic forms of reverie. The space created was organic like a body and also like an environment in which life may exist in unrealised or uncategorized form. The position of the body, extended through biotechnology, can be seen to parallel these forms of organic growth and “life”. Just as abstract growths such as stalactites, and spaces such as caves where much life occurs, exist somewhere between the classification of life and non-life, so too, the place of the extended body exists in an undefined and uncertain limbo between body and object, life and non-life, value and waste.